You may notice that this wild smoked salmon is a paler, more delicate colour than most farmed smoked salmon, which is due to the food the salmon eat. It has a lovely smoky taste and only half the fat of farmed smoked salmon. Take one pack of the smoked salmon, cut into 1cm strips and set aside. Mix together the crème fraîche, mustard, lemon juice, honey and a little pepper. Put the grated celeriac into a mixing bowl and add the dressing. Add the parsley and reserved salmon strips and toss together carefully. 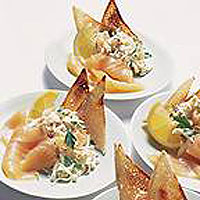 Arrange a piece of the uncut smoked salmon on each of 4 plates, add a spoon full of the celeriac salad and garnish with a slice of lemon. Serve with some crisp homemade Melba toast or crusty bread. Hollow out the halves of 4 organic lemons, reserving the juice and fill each of them with Waitrose Organic Smoked Salmon Pâté. Use the reserved lemon juice and a little olive oil to dress some finely shredded raw fennel. Serve with triangles of toast and butter.